Jeff Kipila struggled at the plate at short-season Bend in 1988, but he ended the season strong, according to The Bend Bulletin. Kipila did so by going 3 for 4 in one game and hitting the game-winning sacrifice fly in another, The Bulletin wrote. "Things are starting to pick up, and I'm feeling really comfortable at the plate," Kipila told The Bulletin. "I'm seeing the ball better." Kipila hit .206 overall for Bend that year. He improved on that mark in later years enough to make AAA. In seven seasons, though, he never made the majors. Kipila's career began that year, taken by the Angels in the 12th round of the draft out of Elon University in North Carolina. At Elon, Kipila hit .438 in 1988, a mark that no one at Elon had managed to match by 2014. Kipila started with the Angels at Bend. He picked up two hits in a June rally. 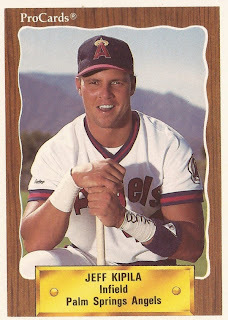 He got into 69 games and hit nine home runs. He was credited with turning a crucial double play in an August game. He split time in 1989 between single-A Quad City and Bend. He knocked in the tying run in a July game for Bend. Kipila played 1990 at high-A Palm Springs. He hit .241 in 72 games. He returned to Quad City in 1991. Kipila's first look at AA came in 1992 at Midland. He hit .259 over 115 games there. He made AAA for the first time in 1993 at AAA Vancouver. He got into 32 games there and hit .313. It was his last season in the Angels organization. Kipila played one more season in the Expos organization, hitting .257 in 95 games, ending his career.